There are loads of things that you can do to make a real difference to the campaign to ensure Britain remains a full and active member of the EU. It is vital that our MPs are fully aware of the views of those who vote for them. It does not matter what party your MP is from, or what their stance on Brexit is, they need to know your views. They represent YOU! We need to leave our MPs in no doubt about the growing resistance to Brexit. The importance of this task cannot be overstated. Please write regularly, either by email or by a posted letter. Click on your MPs name below to email them, or find their email and postal address here. Always send emails to their parliamentary email address as these are logged, as is a lack of a response. Copy in the constituency email address if you like. VERY IMPORTANT - ensure you include your full address and postcode (best at the start of the email) in every email or letter. MPs will only look at correspondence from their own constituents. Decide what Brexit aspect to write about: this could be a personal concern you have, something relevant to recent developments, something that your MP has said, something that affects your local area. Follow up: if you receive an unsatisfactory response or no response, challenge it. A lack of response does not mean that your message has been unread. Just keep writing. To help us keep track of any shift in the positions of our 12 Devon MPs, please let us know what you are asking and what responses you receive. Whilst in writing mode, you can also write to Lords and MEPs. Most MPs hold regular surgeries for their constituents. It’s a great idea to go along to these to discuss your Brexit concerns face to face with your MP. You can go with a group of friends or colleagues if they are also constituents. Keep a lookout for any public meetings your MP arranges. Write to the letters page of your local newspapers. Keep these letters focused on local issues, such as the local economy, environmental protection, jobs. Challenge/support Brexit related articles. Comment on articles you find online. Take part in radio phone-ins, both local and national ones. Try to get into the audiences of TV programmes such as Question Time. Talk to people! There is nothing undemocratic, unpatriotic, or wrong with challenging Brexit. It is time we become less afraid to discuss Brexit. We need to shift the public narrative from a quiet acceptance of Brexit, to a realisation that Brexit is not a foregone conclusion, and certainly not a done deal. 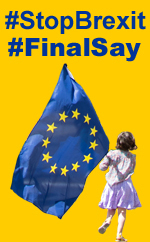 We need to make the case that democracy is an ongoing process and that it is in the best interests of our country that we are given a FINAL SAY on the outcome of the governments negotiations. Take part in activities organised by Devon for Europe - there is something for everyone, including flag waves, street stalls, meetings, social events, workshops and courses, public meetings and speaker events. Your contribution, however small, makes a huge difference to the effectiveness of our campaign. Attend all large national events such as marches, demonstrations, rallies - help make them HUGE! Bring all your friends and family. Encourage friends, family and work colleagues to join you in your campaigning activities. Every one of us has a part to play. For You - You can download a print ready A5 flyer of the above content in PDF format to save on your device, or to print out. Download front | back. For Us - Printing leaflets, and running events does not come cheap (although we do of course do our very best to find the most competitive prices), please help us by donating.